As you may recall from the last few lessons, many crucial steps in the IVF process are completed by a clinic’s laboratory. 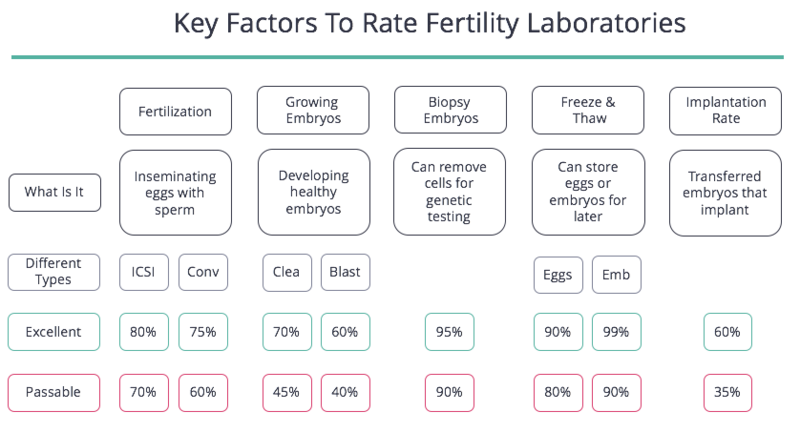 There is a wide range in laboratory quality, and being treated at a clinic with a world-class laboratory can double a patient’s chances of success during any given IVF cycle. It’s crucial that a clinic’s laboratory operates 7 days a week and has multiple embryologists on staff. In circumstances where patients had to wait for the laboratory to re-open on Monday, success rates were needlessly lower, as you can see in the study below. Also, ensure your clinic has a disaster recovery plan that includes real-time monitoring systems to indicate when equipment begins to fail, and an uninterrupted power supply if power gets severed. Finally, laboratories can be easily started, and are loosely regulated, so don’t expect the government or any governing body to help you ascertain if your clinic’s laboratory is competently-run. If you take a tour of your clinic, they’re likely to tout their laboratory is certified or accredited by one of the organizations below. The College of American Pathology (CAP) runs a peer-inspection program that ensures laboratories have methods for record-keeping and improvement. About 96% of laboratories have CAP accreditation (find yours here) and if yours doesn’t, that’s a red flag. CAP accreditation does not mean a laboratory is of high quality. The State of New York has its own system of licensure, which is significantly more stringent than CAP’s, and every fertility clinic’s laboratory in the state should be certified (see here). If a non-New York laboratory has New York accreditation that should be considered an encouraging sign. The FDA regulates laboratories if those laboratories work with donor eggs or donor sperm, which nearly all do (see if yours is registered here). Inspections are infrequent and they look to ensure standards are being met so diseases are not transmitted through sperm and egg donation. We view this similarly to CAP: it’s only noteworthy if your lab is not registered. If it is registered, it’s not a big deal.